52 Ancestors, No. 5: “Grandpop” Morris Anflick | Photo Restorations by Tim G.
My own personal memories of Grandpop, my mother’s father, are few and quickly dissipating. I remember he used to stop by randomly, bringing with him a bounty of Chinese food. The family would sit around the table, with Grandpop at the head, and talk while enjoying the meal. I remember that one of his last gifts to my brother and I were a pair of 16″ Hulk Hogan action figures. He didn’t care for professional wrestling, himself, but he knew we kids went crazy for it, so that’s what he gave us. By the time I had started researching my family history nearly six year ago, I had forgotten what he looked like. Grandpop died on January 17th, 1986, when I was five years old, and he left behind him one of our family’s most enduring traditions. He was born on May 27th, 1922, the youngest son of two Russian Jewish immigrants, Henry and Minnie Anflick. He had five older siblings, two of whom died, before their time, of tuberculosis, and one younger sister. Unfortunately I did not inherit his remarkable memory; he apparently recalled his older sister, Ann, bathing him in the sink. 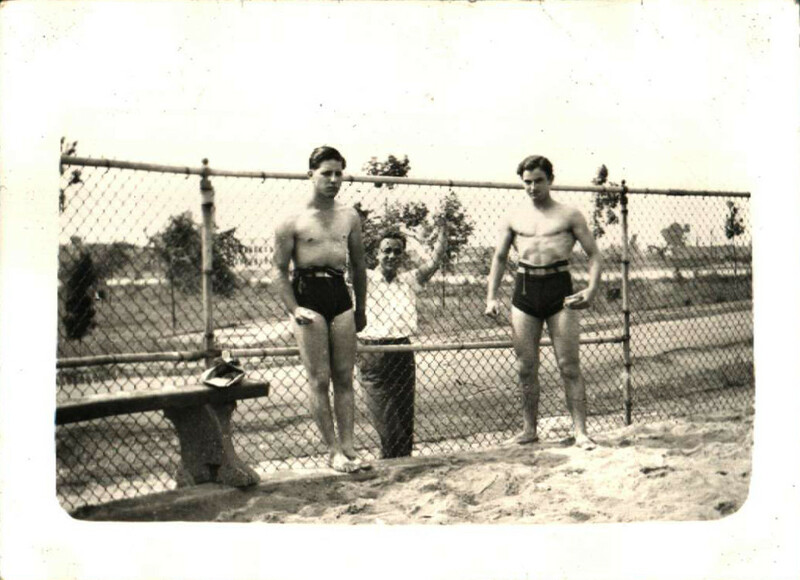 From old family pictures, it appears that he enjoyed displaying his physique on the beach, but beyond that I don’t know much else about his youth. Some more investigation is in order…. He took on several jobs during his lifetime, most notably a pipe fitter. Many of his various unwieldy tools ended up in our garage after he had passed. Later on he was a Sheriff’s Deputy of Montgomery County, Pennsylvania. The portrait above is the one he carried with his badge, brightened and touched up a bit by yours truly. He was a veteran of the Second World War. We have several photos of him in uniform, but I don’t yet know the details of his service. I heard that the war changed him, and that he returned from Europe with a shorter temper. My mother usually laughs when regaling us his with his antics, so I hadn’t gotten the impression that that had caused any lasting hardship. Grandpop married my maternal grandmother when he was 37 years old and she was 34. This was well above average in my family tree, and went without explanation for quite some time. I learned on FamilySearch.org that Grandpop was married once before he was married to my grandmother. He married a model named June when he was 24. I understand that this marriage did not work out, that it produced no children, that the two were separated for most of the marriage, and that it officially ended ten years after it began, when Grandpop was 34. There are bound to be pictures of this model named June somewhere, but I don’t have any of them. Within three years of that divorce, Grandpop had married my grandmother, Betty, whom I would call MeMe, and they had a daughter, my mother, Celia. Although this marriage would produce three children, it too wouldn’t last. My impression of Grandpop, after having heard many stories about him, is that he was a very interesting, with an offbeat sense of humor—that is, he was my kind of guy. He was Jewish, but not observant; his second wife was, after all, an Italian Catholic. He was more active in the Shriners, and rode horses with the Shriners in parades, wearing his Shriner fez. My Uncle Craig told me that Grandpop developed a particular specialty in each of his children: scholarship in my mother, craftsmanship in my Uncle Al, and spirituality in himself. He was a big fan of boxing, and he taught his boys to box. He used to record himself calling into talk radio programs. Unfortunately these recordings have not survived. He also enjoyed talking on the telephone with his grandchildren, especially my younger brother, so I hear. Although he did visit his grandchildren, as I have described above, I believe no pictures exist of us together. I suppose we didn’t expect him to leave us so soon. When Grandpop died in 1986, he was buried with military honors at Fort Indiantown Gap National Cemetery in Lebanon, Pennsylvania, over a hundred miles from home. 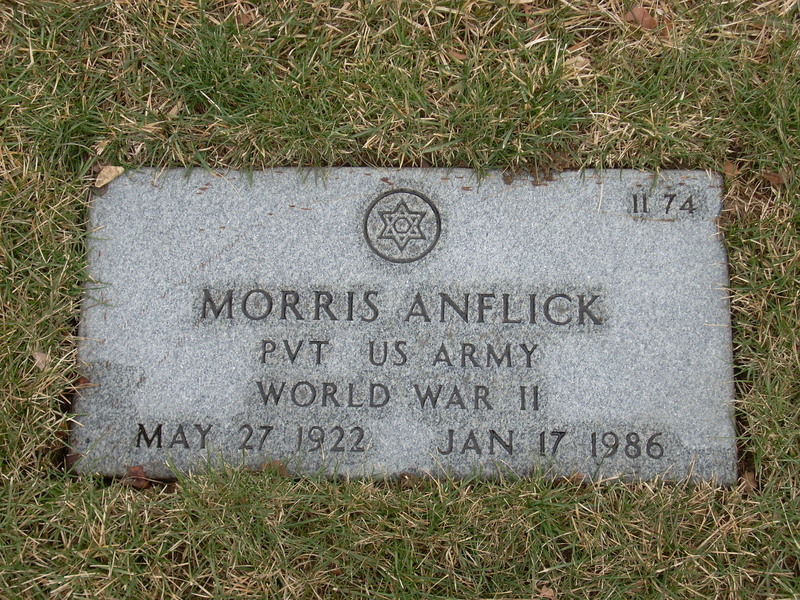 As I started researching the family history, I discovered that everyone else in our branch of the Anflick family was buried at Montifiore Cemetery in Rockledge, minutes from home. At first I thought it sad that he should be buried so far away from his family. My uncle assured me that Grandpop’s wish was to be buried at the national cemetery. Upon just a few minutes of reflection, I realized that he made the right choice. The car ride out to Grandpop’s grave has been a Graham family tradition since 1987. It has been a time for us to be together—a time for a mini adventure, driving through the Lancaster countryside, playing travel bingo, feeling the momentary weightlessness of clearing the crest of Lancaster’s hills, and saying hello to the farm animals. We’d visit his grave site, lay some flowers, and think of good old Chinese food. On the way back, we would have lunch at of Lancaster’s fine restaurants. Zinn’s Diner and Stoudt’s Brewery had been favorites for years, though we recently switched to the Victory Brew Pub in Downingtown. I cherish these memories, and had Grandpop been buried with his family just outside of town, I wouldn’t have any of them. Last weekend our family’s took its 27th annual trip to Grandpop’s grave. Not all of us have made it to every trip, for various reasons, but we usually get a decent crew together. With Grandpop’s grandkids now having kids of their own, there are even more of us to cherish the event. 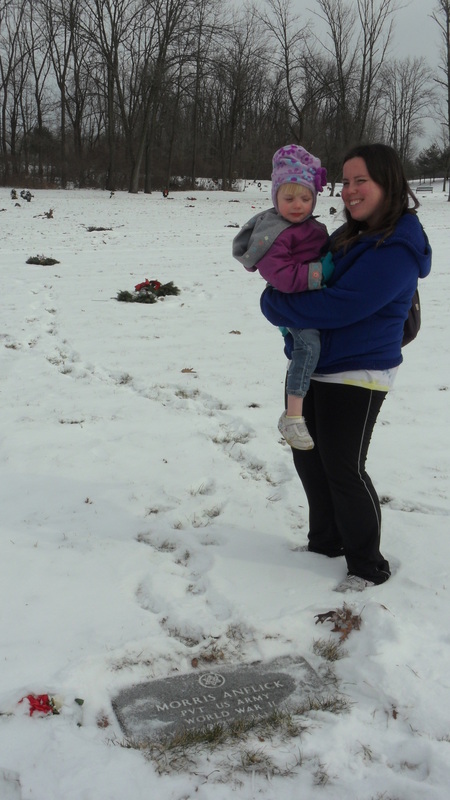 My sister and niece at Grandpop’s grave, January 2014. 52 Ancestors, No. 10. 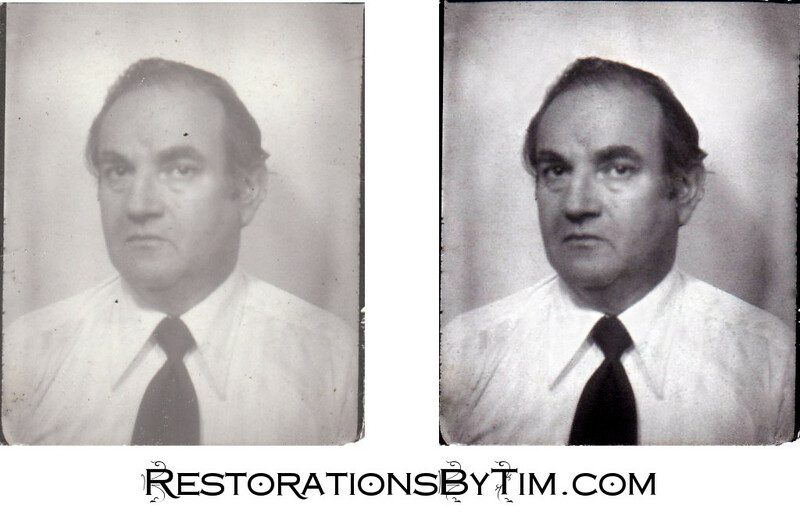 Henry Anflick: Honest, Reasonable, Reliable Paperhanger | Photo Restorations by Tim G.